This ring is my second for the "Ring a Week" challenge. It's a simple square of sterling silver with a square wire band. My inspiration came from the pocket of my work apron, which often hides odd bits of half-finished jewellery. I imagined a precious stone, wrapped in a handkerchief for safe keeping.. The setting is quite secure, the stone is seated in a square hole and the work-hardened fold holds it in place. 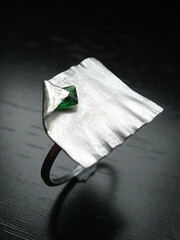 Sadly, I cracked the original triangular citrine cabochon, but this little square green zirconium is nearly as good. I'm feeling really positive about this challenge, less pressure than Ring a Day and more room to play - I hope. Thanks. Why not join in? New to your blog. I like your imaginative streak.